True ownership of one share of Coca-Cola stock framed like you want. The recipient becomes a real shareholder of the company. "It's the real thing" and so is this stock certificate. A Classic! "Share" a coke - Enough already! 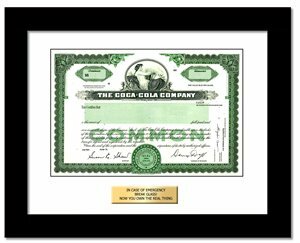 The Coca-Cola stock certificate is strikingly ornate. It represents a snapshot of history incorporating the company's name, logo, corporate seal, and printed signatures of corporate officers. Get yours while you can because in the not too distant future, the industry will eliminate physical stock certificates making these valuable collectibles. The Coca-Cola Company is a worldwide manufacturer, distributor and marketer of non-alcoholic beverages, primarily carbonated soft drinks and a variety of non-carbonated beverages. Brands include Coke, Dr. Pepper, A&W, Sprite, Fanta Minute Maid, and more.